Parallel growth of two crystals with excellent terminal faces, a dominant pinacoid and small pyramidal faces. Both crystals are completely clear (gem quality) and have an extraordinary luster and color. Group of crystals with excellent terminations consisting of a dominant pinacoid and small pyramidal faces. The crystals are clear (gem quality) and have extraordinary luster and color. 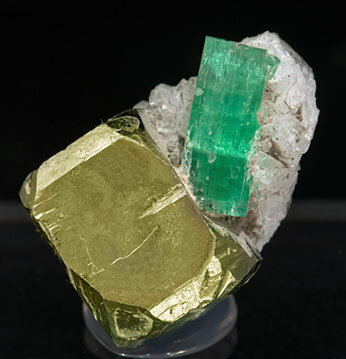 Doubly terminated crystal with two different terminations, one of them polycrystalline, with pyramidal faces, and the opposite flat and slightly rough. The crystal is very transparent and bright, has an excellent color of the best quality for the locality. 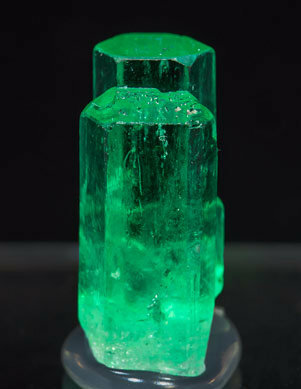 Who does not like the Colombian emeralds? The depth of color and the perfection of its crystals are a luxury. This group of parallel crystals with their color and perfect geometry show us the reasons why this mineral is so appreciated. 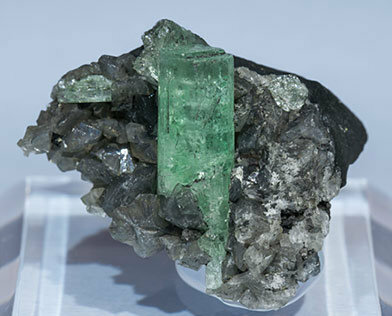 It is not very well know but in the northwest of Spain, in the countryside, it is possible to find some reasonable Emeralds (opaque of course) such as this representative sample. 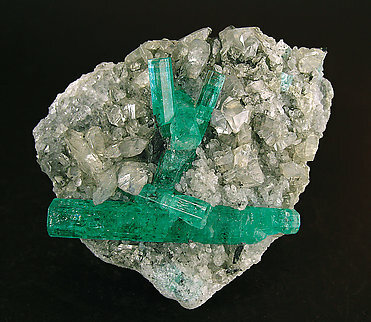 Miniature of prismatic crystals, two of them dominant, with perfect terminations on top, good transparency and intense green color, slightly zoned perpendicular to main axis. On the main crystal top termination we can see something similar to dissolution structures and inside the crystal some carbon inclusions. A luminous specimen. 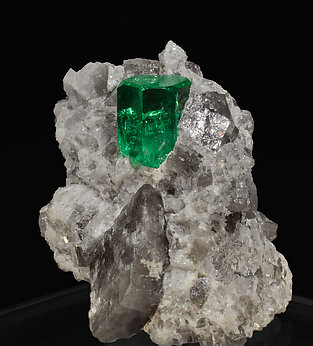 This extraordinary specimen brings together all the features that any collector would dream of in an Emerald: perfection, intense color, transparency, doubly terminated, a large crystal, and on matrix. The matrix of a small amount of Pyrite on Calcite has a form, size and general look that sets the fabulous crystal off nicely. So in summary as good as the photos suggest. Very elegant with such transparent crystals. The main crystal is doubly terminated and has a good accompaniment of other smaller ones. They are all nicely positioned on the matrix of Calcite crystals. A clean specimen. 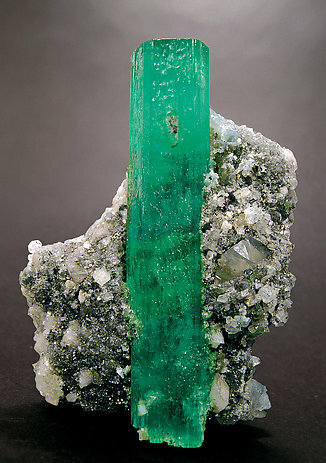 Sharp Emerald crystal, completely transparent, bright and with a deep and uniform color. Its termination is more complex than usual, due to the presence of the dominant face of a pinacoid and the faces of two pyramids, one of them bevels the edge between the prism and the pinacoid and the other bevels the corners showing triangular forms. 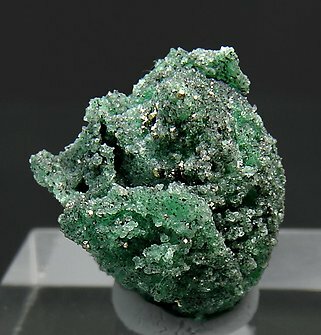 It is on a matrix with a rhombohedral crystal of Calcite. The sample is from the J.S. White collection, whose label we’ll send to the buyer. A definitive specimen. 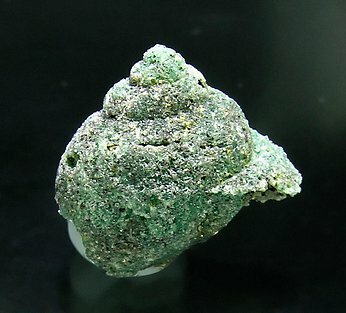 Fossilization on emerald, in this case a Gastropod, is very, very, rare. 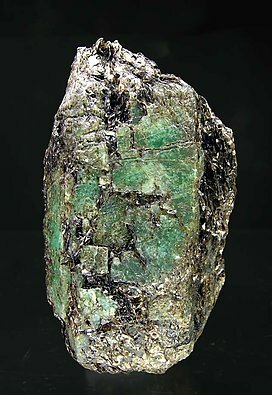 On the surface of he fossil, with the recrystallization of emerald there are also small but easily distinguishable crystals of Pyrite. Even with its small size, the specimen is exceptional due the perfect preservation of the fossil. 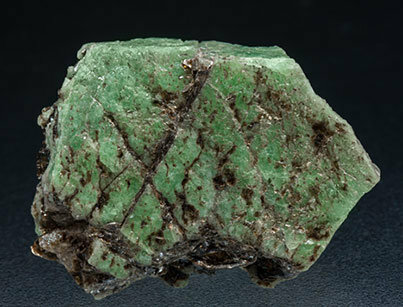 We must consider that fossilizations by Emerald, recently introduced, is quite extraordinary. Sharp crystals with very well defined faces and edges, one of them clearly dominant, with an excellent termination that shows the pinacoid and pyramidal faces. 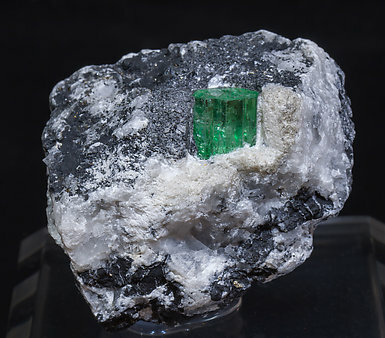 The emerald crystals are on a rocky matrix with small laminar Albite crystals and are transparent, very bright and have an intense, deep and uniform color. 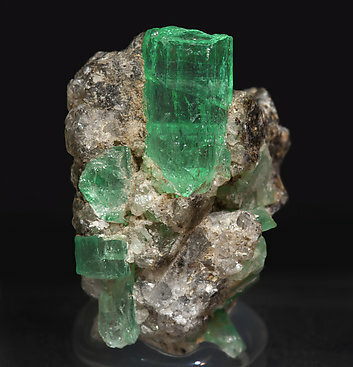 Beryl crystal (emerald variety) with an excellent definition of faces and edges and an upper termination that is rough but complete. The crystal is very clear and has excellent luster and color. 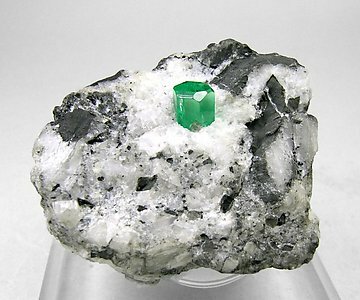 The sample, in gem quality, is implanted on a Calcite matrix. 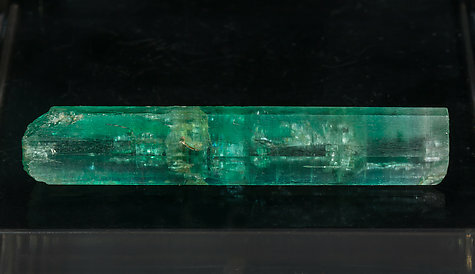 A single Beryl (emerald variety) crystal with perfect terminal faces. It is transparent, bright and on a rocky matrix with platy Calcite crystals. Very transparent crystal that has extraordinary luster and color. In addition to all of this it has an excellent definition of faces and edges and its termination is busy because there are two sets of pyramid faces plus a very neat pinacoid. The crystal is absolutely gemmy and it is implanted on a Calcite matrix. 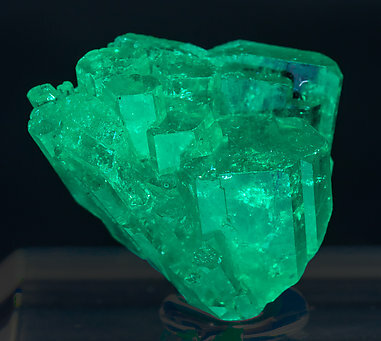 Short prismatic Beryl crystal (emerald variety) with very well defined faces and edges and an excellent, smooth pinacoidal termination, transparent, very bright, with an intense and uniform color and implanted on a matrix with Calcite. A high-level sample due its size and its transparency. 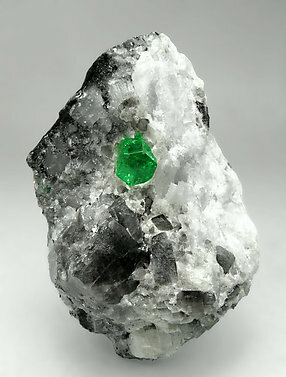 A very sharp Emerald crystal with a very luminous and uniform green color. We call your attention on the transparency and clarity of this crystal, implanted on a rich Calcite matrix. 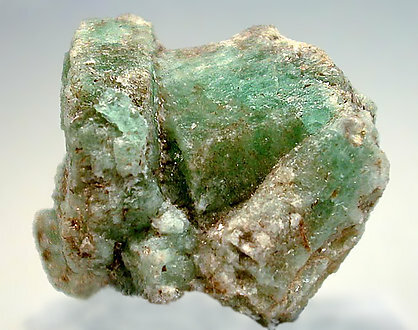 A powerful group of numerous very well-defined, transparent and brilliant isolated Beryl (Emerald) crystals. Excellent terminations and intense green color. They are implanted on a rocky matrix with rhombohedral Calcite crystals. Given its color and crystal perfection we consider it a really great specimen. Crystal on matrix with very well defined faces and edges and with a good flat termination. 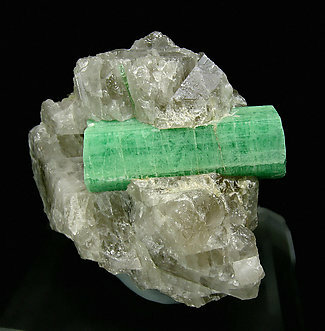 It has a thin surface naturally welded by Calcite. 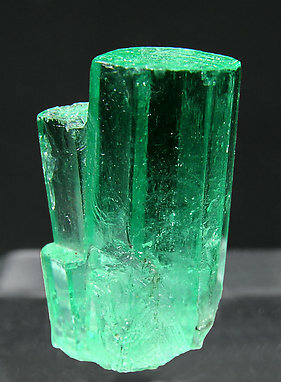 Beryl (emerald variety) crystals with very well defined faces and edges and with a very deep color. They are on a rock matrix, partially imbedded in Quartz and with laminar Molybdenite crystals, a very uncommon association. The sample is from the Vallecillo collection, in Madrid. 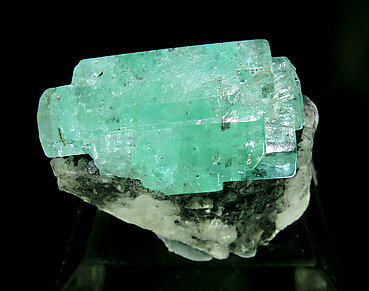 A large Beryl (var. 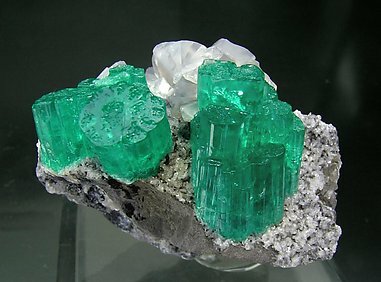 Emerald) with intense color. 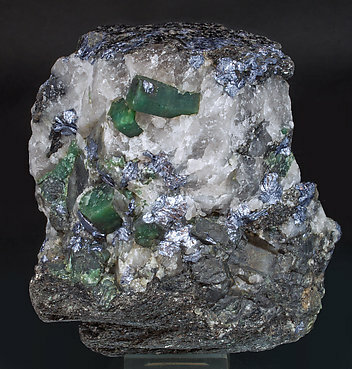 The specimen preserves the hexagonal shape, with curved faces partially covered by Muscovite as a matrix. 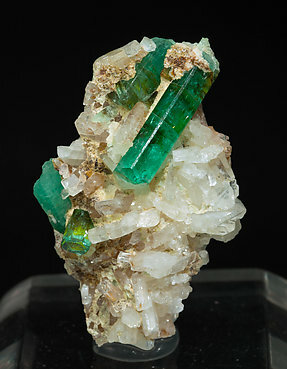 From the most classic Spanish locality for Emerald, although nowadays it is quite impossible to obtain specimens there. 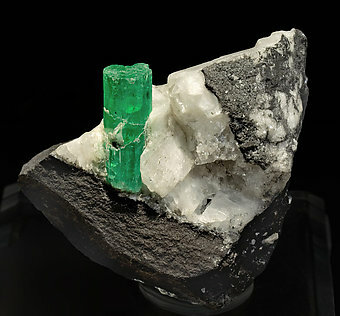 Thick tabular Beryl (emerald variety) crystal a distinct hexagonal shape, with inclusions of leafy Phlogopite aggregates. 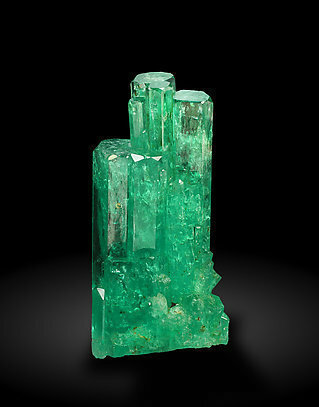 Doubly terminated single Beryl (emerald variety) crystal with excellent terminal faces. It is clear, bright and has a very intense and uniform color. On a Calcite matrix, it also is with a complete Pyrite crystal that shows the very well defined forms of the cube, the octahedron and a pyritohedron. An excellent thumbnail, very unusual. Prismatic crystal of very well-defined faces and edges, of uniform color and esthetically situated on the Quartz matrix. It is from an uncommon locality. Parallel group of prismatic crystals all them doubly terminated, really big and having good color and transparency, free of damage and esthetically placed on the matrix.